Have you ever daydreamed of sipping hot chocolate and sampling pastries in Paris with the legendary fashion designer and glitterati mainstay Coco Chanel? 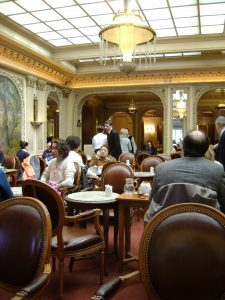 While that’s a lovely but unattainable fantasy, we’ve got the next-best, real-world option: paying a visit to Angelina, a world-famous patisserie-tea room on the Rue de Rivoli that was a favorite haunt of Madame Chanel—and of Marcel Proust, Audrey Hepburn and virtually every luminary in the haute-couture fashion design world throughout the 20th century. You’ll become an instant fan, too! 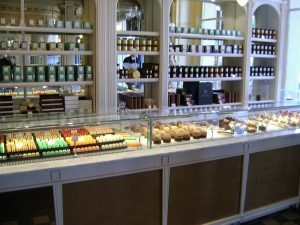 Angelina was founded in 1903—the height of the Belle Epoque in Paris—by Austrian confectioner Antoine Rumpelmayer, who moved to the South of France in the late 19th century and opened several small bakeries. His cakes and pastries became so well known that the Empress of Austria-Hungary, on a visit to France, was compelled to sample them, and immediately became Rumpelmayer’s biggest supporter. 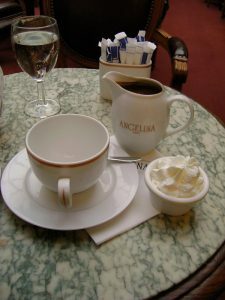 Buoyed by Empress Elisabeth’s endorsement, Rumpelmayer moved to Paris and opened the Rue de Rivoli tearoom he dubbed Angelina, named after his daughter-in-law Angeline. And the shop was an instant success, attracting much of Paris’s high society and many celebrities of the day. Among them were Chanel, who adored the salon’s chocolat Africain (more on this in a bit) and always sat at the same table. French architect Edouard-Jean Niermans designed the interior of the salon in the classic Belle Epoque style of the era. Leather-backed chairs surround marble-topped tables, all lined up under a gorgeous glass ceiling and overlooked by gilded frescoes, elaborate crown molding and soothing tones of gold, yellow and cream. The front of the tearoom includes a wall-length patisserie counter displaying the many delicious desserts (all of which also are available for take-away orders) and a selection of other baking products, as well as a photo-worthy grand staircase that leads up to the dining rooms on the second level. And as for the pastries … tellement delicieux! Really, you can’t go wrong with any of the dessert selections available at Angelina, from a simple but perfect croissant au beurre (made with butter, not margarine, as are many mass-produced bakery croissants) to delightful pain au chocolat; from sweet and sour lemon tarta to a melt-in-your-mouth millefeuille; and from a creamy Saint Honore to wonderfully soft and sugary eclairs. There’s usually also a variety of seasonal pastries, made with the freshest ingredients available throughout the year. But there are two dishes that are world renowned at Angelina: The aforementioned favorite of Coco Chanel, the chocolat Africain (hot chocolat), and the Mont Blanc pastry that received its name because it looks like the snow-dusted Mt. Blanc peak in the French Alps. The chocolat Africain isn’t your run of the mill, Starbucks-produced hot chocolate. In fact, it’s more like drinking liquid fudge than the watered-down drinks Americans are used to (you’ve been warned!). A thick mix of cocoa from Niger, Ghana and Ivory Coast (hence the Africain moniker), the chocolat Africain is the very definition of decadence. Served piping hot in a tiny ceramic pitcher and accompanied by a ramekin of fresh whipped cream, the hot chocolate is so deliciously sweet and rich that it’s actually difficult to finish an entire serving on your own. So consider splitting an order so you can sample the tearoom’s other specialty: the Mont Blanc. The most famous dessert sold at Angelina, the Mont Blanc consists of a meringue cookie topped with whipped cream and covered by an outer shell of piper chestnut cream. (There are often chocolate and fruit versions of this signature pastry that are available on the tearoom’s seasonal menus.) It’s the painstakingly piped squiggles of chestnut cream that give the dessert its mountain-like appearance. 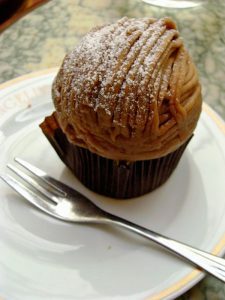 Simply put, the sweet and nutty Mont Blanc is a must-try dessert when visiting the City of Light. There’s a reason the tearoom sells hundreds of these fine pastries each and every day. And you can even buy tubes of chestnut cream if you’re an aspiring patissier who wants to recreate—or at least try to copy—the Mont Blanc when back home. As a full-fledged tearoom, Angelina offers much more than just pastries, baked goods and hot drinks. 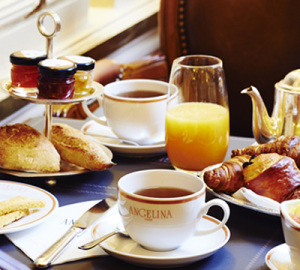 Breakfast-brunch offerings include: omelets; eggs benedict; the “Angelina Croissant,” a croissant sandwich with eggs and either Parisian ham or smoked salmon; fruit salad; pain perdu (French toast); truffled scrambled eggs; soups; and a variety of salads. Lunch options include: salads; club sandwiches, croques and tartines; beef tartare; smoked salmon; a handful of pasta dishes; and even assortments of foie gras or caviar. Hot tea and coffee, freshly pressed fruit juices, wine, champagne and soft drinks also are available. 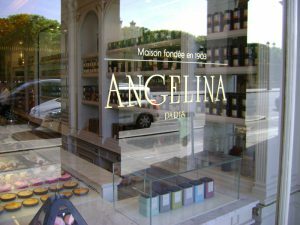 Angelina is one of the most famous patisseries in the world, and as such draws huge crowds of both locals and tourists. If you want to be seated right away, show up at opening, or shortly thereafter, or come an hour or so before closing (although then you run the risk of your pastry of choice being sold out for the day). Or make reservations through the tearoom’s website if your schedule demands a particular seating time. And finally, the offerings at Angelina aren’t cheap—those decadent pastries and gorgeous Belle Epoque atmosphere come at a fairly steep price. 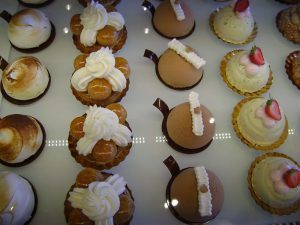 Pastries begin at above 7 euros each, with the signature Mont Blanc priced at 9.20 euros (nearly $11). 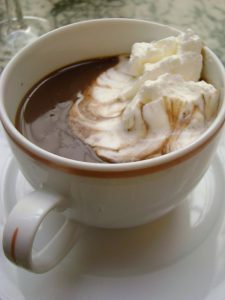 The famed hot chocolate costs 8.20 euros (around $10), while a breakfast combination of hot chocolate (or other hot drink), fresh fruit juice, a selection of mini pastries and French bread with butter, honey, jam and chestnut cream will set you back just shy of $25. Expect your lunch, with a drink, to ring in somewhere north of $40. Hours: Monday-Thursday, 7 :30 a.m.-7 p.m.; Friday, 7 :30 a.m.-7 :30 p.m.; Saturday and Sunday, 8 :30 a.m.-7 :30 p.m. 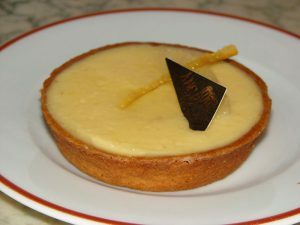 This entry was posted in Breakfast, Famous Paris destinations, Food, French cuisine, Patisseries, Right Bank and tagged Angelina, Antoine Rumpelmayer, Audrey Hepburn, Belle Epoque, chocolat Africain, Coco Chanel, Eduoard-Jean Niermans, hot chocolate, Michel Proust, Mont Blanc pastry, tearoom by Bob Adams. Bookmark the permalink.